Designed for EFI racers with single nozzle limitations. 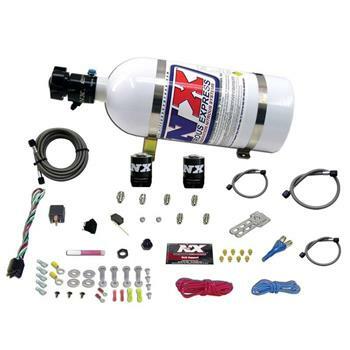 The “S.H.O.” has the highest horsepower output of any single nozzle nitrous system on the planet. The S.H.O. nozzle utilizes a .116” internal N2O passage that can produce up to 400 wheel horsepower. System comes complete with bottle, extra long stainless feed line, 500HP Shark nitrous solenoid, wot switch, S.H.O. nozzle and all electrical components necessary to complete the installation.